Mutes redness, veins, tattoos, beard shadows, and skin discolorations. 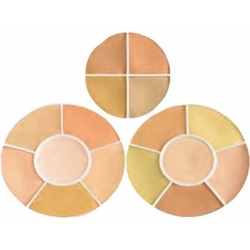 4 Color Palette (SK-1) Includes Shades: MY-2 Mellow Yellow Normal, MO-2 Mellow Orange Lite, CC-3 Coverette Cover-Up Medium and FS-3 Five O'Sharp Concealer Olive. 6 Color Palette (SK-100) Includes Shades: MY-1 Mellow Yellow Fair, MY-2 Mellow Yellow Normal, MO-1 Mellow Orange Fair, MO-11 Mellow Orange Lite, MO-2 Mellow Orange Medium, and CC-1 Coverette Cover-up Ultra Fair. 6 Color Palette II (SK-200) Includes Shades: GC-1 Special Green Concealer No.1., CC-1 Coverette Cover-up Ultra Fair, HY-1 Special Yellow Highlight No.1., MO-1 Mellow Orange Fair, CC-2 Coverette Cover-up Fair, and CH-0 Cream Highlights Natural Lite.